Camping Calatella in Italy, placed in Marina di Massa near the beach, is the ideal place to spend your Tuscany holidays, enjoying a lively and welcoming atmosphere. Opened in 1969, it has been welcoming their guests since then with care, courtesy and accuracy; our regular customers know that, and they feel more and more welcome every year and they are considered a fundamental part of the history of our campsite. 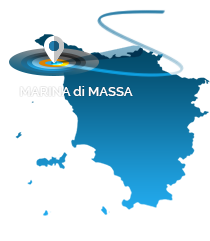 Discover the nearby seaside, the mild climate and the sunny and spacious beaches in Partaccia; after dinner, enjoy your evening in the small centre of the nearby Marina di Massa, savouring a delicious ice cream or sipping a drink. Go for a stroll on the charming jetty and enjoy the evening fresh breeze, watching the starry sky. Discover the stylish Versilia and especially its jewel, Forte dei Marmi, which is just few minutes away from Partaccia, and its luxurious boutiques; a little further you can indulge on a long and pleasant stroll in Viareggio. If you are an art, history and architecture lover, you can quickly and easily reach the worldwide known art cities in Tuscany from the Camping Calatella in Marina di Massa; cities such as Florence, Pisa and Lucca, where you can lose yourself in a breath-taking journey through medieval and renaissance art. The campsite is also conveniently placed near the amazing landscape of Liguria, including the astonishing Cinque Terre, Lerici and Porto Venere. Experience a one-day trip in one of these sparkling and unique seaside resorts. If you favour the mountain landscape and wish to spend some time there, you can easily reach the majestic Apuan Alps, just 10 kilometers away from the campsite; you could also cross the Massa-Carrara border and discover another splendid territory: the Garfagnana in the province of Lucca. Camping Calatella offers to their guests flat grass pitches for tents, campers and caravans, and different sorts of bungalows and caravans with porch. For those who love spending long periods at our facility, we offer seasonal deals and winter depot for campers or caravans. The attentive staff at Camping Calatella in Tuscany take great care of their guests, its facilities are accessible to people with disabilities and its toilet facilities are modern and neat; two large shaded parking lots, a bar, a restaurant serving fish specialties and a grocery shop selling fresh bread every day are available for all guests; within the campsite you can enjoy a large playground with a picnic area, two table tennis tables, a table football, a soccer field and a soccer and basketball field for children. Free Wi-Fi is at our guests’ disposal all over the campsite, as well as a free internet point. Some of our guests have been choosing the Camping Calatella in Marina di Massa, located in Partaccia, for more than 40 years as their holiday destination and strong relationships and bonds have been developed and get stronger summer after summer… a home away from home! You can also take your furry friend with you! Camping Calatella is also a dog-friendly camping in Tuscany: the wide areas and the friendly and cosy atmosphere make our campsite the ideal place for your dog as well, and so does the dog-friendly beach (Bau Beach), located very close to the campsite.